The professional form of organizing is the source of health care’s great strength as well as its debilitating weakness. In its administration, as in its operations, it categorizes whatever it can to apply standardized practices whose results can be measured. When the categories fit, this works wonderfully well. The physician diagnoses appendicitis and operates; some administrator ticks the appropriate box and pays. But what happens when the fit fails—when patients fall outside the categories or across several categories or need to be treated as people beneath the categories, or when the managers and professionals pass each other like ships in the night? 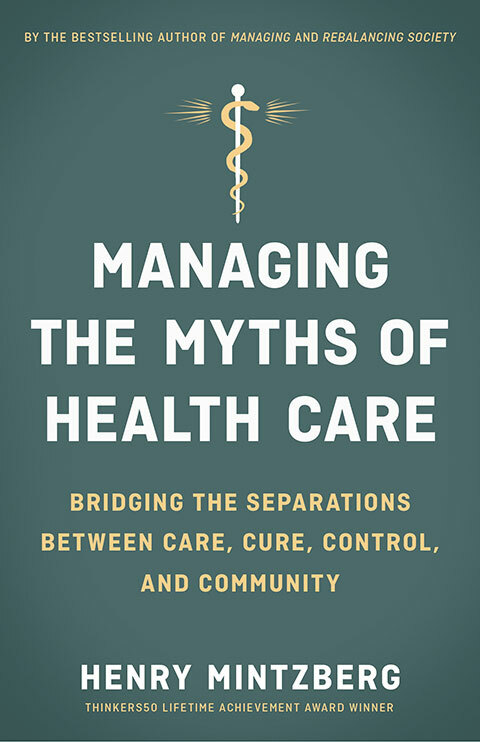 The overall message of Mintzberg’s masterful analysis is that care, cure, control, and community have to work together, within health-care institutions and across them, to deliver quantity, quality, and equality simultaneously. In management no less than medicine, scalpels usually work better than axes. Narrowness pervades health care, from professionals on the ground who can’t see past their specialities, to managers in the offices who can’t see past their institutions, analysts in governments and insurance companies who can’t see past their numbers, and economists in the air who can’t see past their dogma. Reorganizing is the expected disjointed intervention for a health care “system” built on disjointed interventions. While the ill act as a concerted force for spending more locally, the healthy act as a general lobby for spending less nationally. This makes the field of health care sick. There are no management problems in health care, separate from medical problems, nursing problems, or prevention problems. There are only health care problems. Because economics begins before medicine ends, the technocrats of health care have too often trumped the professionals. In the name of competition, health care suffers from individualism: every patient, provider, and institution for themselves. The field of health care may be appropriately supplied by businesses, but in the delivery of its most basic services, it is not a business at all, nor should it be run like one. At its best, it is a calling. I can think of no field that is more global in its professional practices yet more parochial in its administrative ones than health care. Certainly we have to measure what we can; we just cannot allow ourselves to be mesmerized by measurement—as we so often are. Physicians who like to belittle hierarchies of authority are often slaves to their own hierarchies of status. Who can possibly be against evidence in medicine? Me, for one, when it is used as a club to beat up on experience. The essential problem in health care may lie in forcing detached administrative solutions on to practices that require informed and nuanced judgments. It can be taken as almost an axiom of professional work that dysfunctional practices cannot be fixed by tighter administration. The problems have to be addressed within the work itself. Strategy making in the field of health care tends to be about venturing more than visioning, and personal and collective learning more than institutional planning. When we promote leadership, we demote everyone else. How about plain old management? Instead of people pointing the finger at each other, they should be pointing their fingers together at the procedures and structures that set them apart. Health care doesn’t need more measuring and reorganizing so much as better cultures of collaboration that open up the pathways of communication. A systems perspective requires a focus on the person in the community, beyond a patient in a population. There’s a massive amount of health care information out there, some of which I need to know. How much of that part am I actually getting? Is 10 percent a gross exaggeration? And how do I get even that? Haphazardly! To find the systems perspective in health care, look first in the mirror: we are as close as we are going to get. That is because you and I are significantly responsible for promoting our own health, preventing our potential illnesses, and even treating many of our own diseases. The invisible hand that is supposed to serve everyone by serving ourselves turns out to be a visible underhand in much of health care when it serves some users at the expense of others.